TOP STORY: From the bowels of Orlando, it's Hasbro! Since the debut of their booth was packed with previously unveiled items, the level of excitement for the big slideshow was even higher than usual. Armed with a laptop and my pals Mike and Shannon, we aim to bring you not-very-timely information on this grand event. I wasn't able to get free wifi running this time, so let's get started in a timely fashion. (Hey, at least the delay wasn't as bad as the Olympics right?) The panel preshow kicked off with a round of trivia asking if anyone had a vintage carded Hasbro figure... which is kind of an impossibility. But anyway, let's get to the reason we're all here: merchandising! 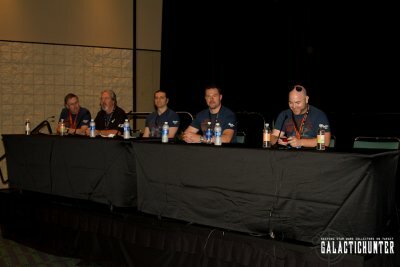 Derryl DePriest, Mark Boudreaux, Brian Burton, Dave Vennemeyer, and Eric Seibenaler (formerly of Transformers) were all on tap to talk about Fighter Pods and... well, let's see. I'm writing this live as it happens. "We're probably not going to blow you away," DePriest said, regarding how new reveals are about to go. "We did bring a few surprises. While today may be a little lighter than you're used to seeing... we're going to have a phenomenal lineup for you at Toy Fair." A Vintage large-size new X-Wing in a Vintage box is coming and is not in the presentation. Brian Burton would not specify whose X-Wing it was. Vintage is on hiatus, as you've heard, "in the vault" for an unspecified period of time-- but, as you've seen with the X-Wing, exclusives may be exempt from this hiatus. So, much like now, you will not be seeing any main-line vintage packaging in stores. 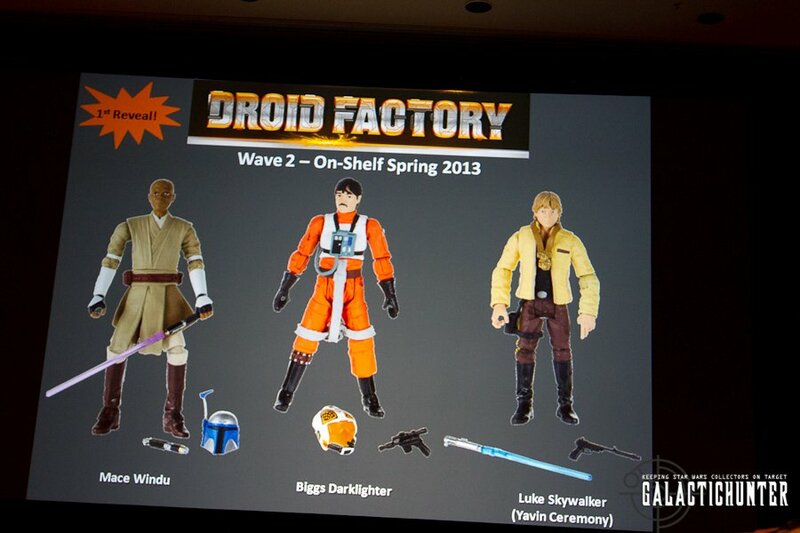 Droid Factory will be back in February, 2013 with 30 or so figures over the course of the year. 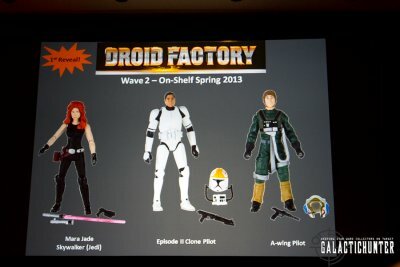 Each wave will have 1 or 2 droids and, as always, it will include a unique piece of robot with every figure. Wave 2 is shown here for the first. The astromech-style cardback will hold new figures like Clone Wars Mace Windu, a taller (they specified height) Super-Articulated Pilot Biggs Darklighter, and a refresh of 2007's 30th Anniversary Collection Luke Skywalker (Yavin Ceremony) with a new blaster and head. "We want to get to 100 Lukes in 5 years," Derryl joked. 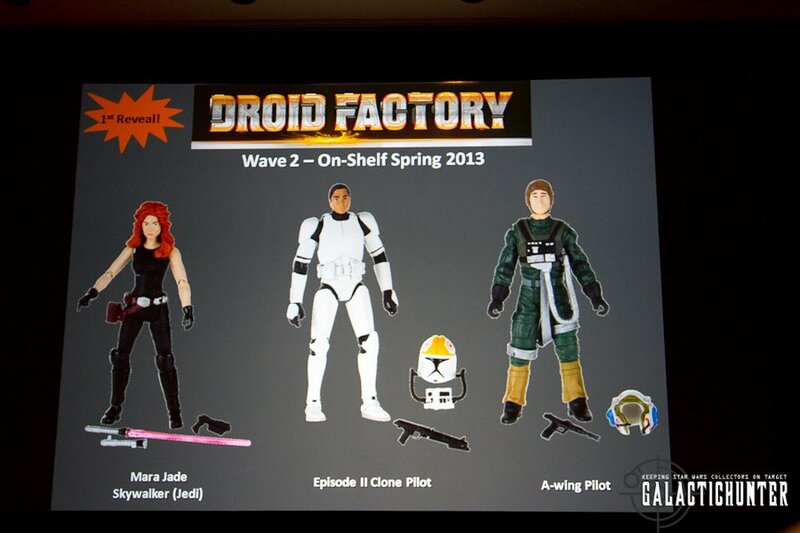 Other figures in wave 2 include Mara Jade Skywalker, Episode II Clone Pilot, and another A-Wing Fighter Pilot. The Clone Pilot is a revised 2011 Vintage Clone Trooper body, the A-Wing Pilot is based on the 2007 body, and Mara Jade, as the fan's choice, is totally new with a new blaster, 2 lightsabers (lit and unlit), and a new blaster. They said Mara's hair is a separate molded piece, which should be evident by the photography. "It keeps the spirit of vintage going," DePriest said," just in a different card format." The wave is rounded out by a new Darth Vader (Bespin) with the banquet accessories like Han's blaster, a blast effect, a lightsaber, and swappable hands based on the 2005 Evolutions sculpt. Captain Rex is a realistic take on the 2008 Clone Wars cartoon armor, and seems to use a mix of existing parts and many many new ones. I like what I see and I think you will too. "Captain Rex is symbolic of something we hope to do," DePriest said, referring to capturing a Clone Wars figure in realistic style in pretty much every wave. 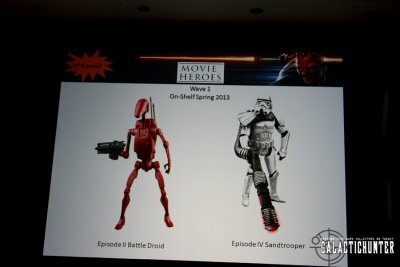 The droids for wave 2? R8-B7 (formerly of the Clone Wars Boba Fett Slave I Battle Pack), and R5-X2, previously only made as a remote control figure. Movie Heroes Wave 1 has Episode II exploding Battle Droid (button in the small of his back) and a really awesome new Episode IV Sandtrooper with a giant, ridiculously awesome gun with a light-up grenade launcher. Why should Jedi have all the fun? "These figures will come out with several carry-forward figures on our new Yoda card," which should have a 6- or 7-month run in Spring. Clone Wars Wave 1 has brand-new versions of Obi-Wan Kenobi, Anakin Skywalker, and a Battle Droid which I think may be a repaint. 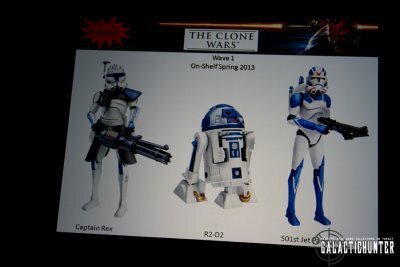 Captain Rex is refreshed with new deco and a non-firing weapon that will spin, R2-D2 is cleaned up and is based on the newer Astromech mold Hasbro has started using, and a 501st Jet Pack Trooper is blue and looks spectacular. He's also the wave's debut, due in Spring 2013. Fighter Pods Serise 4 hits Spring 201 and 125 figures are on deck including Ki-Adi-Mundi, Flamethrower Clone Trooper, Fordo, Carnor Jax, melting Han Solo in Carbonite, poncho Jango Fett, Greedo, Asajj Ventress, a Galactic Marine, Greedo, Han Solo Stormtrooper, and many more. Some of these may be series 3 but they're on the series 4 slide, so if I'm wrong, well, I'll refund the money you paid to read this. A rumor going around the floor was Jaxxon could find a home here. The PC game was shown and described as "glamorized bowling" by Eric Siebenaler. Rapid-fire and rapid reload launchers were shown at Comic-Con and are here again, with nifty slam-loading Hailfire Droid and Republic Gunship launchers. "It's visceral." 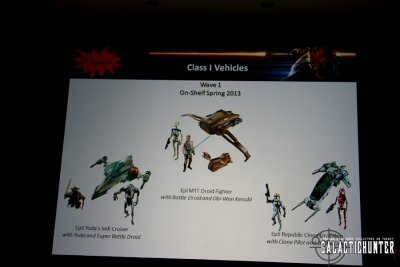 Class I Vehicles each include 2 figures instead of 1 this time around. The wave will include a mini awesome Episode II- Yoda's Jedi Cruiser with Yoda and a Super Battle Droid. The MTT Droid Fighter will connect to this year's MTT with a Battle Droid pilot and Obi-Wan Kenobi. The Episode II Republic Clone Dropship is a redeco of this year's red one, but in blue with a Clone Pilot and Battle Droid. Mini-Rigs are back, people! Good times. Yoda's Jedi Cruiser is probably my favorite, and is a removable build-a-droid piece you can swap out at your leisure. The best part of all of these is that they're wave 1 2013 releases, which means a new SKU, which means that "wave 1 syndrome" of things being widely available hopefully will apply here. 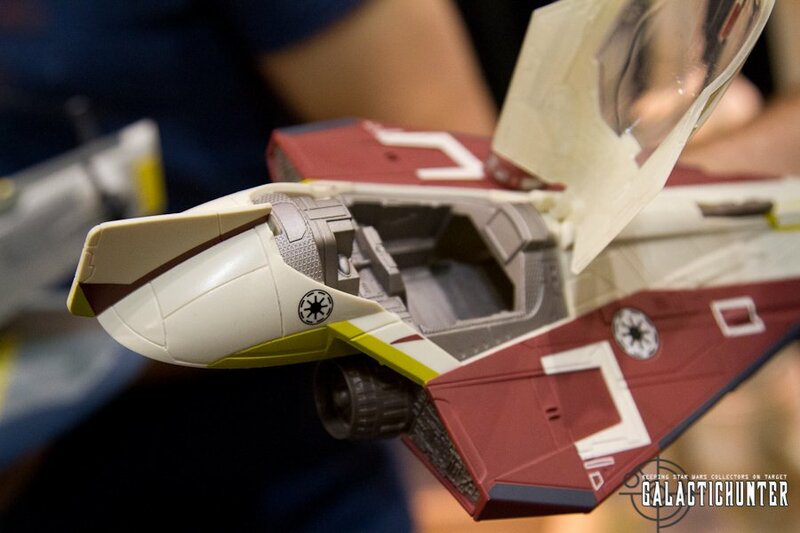 Class II vehicles include the return of the red Republic Fighter Tank along with Obi-Wan's Jedi Starfighter, completely retooled along with Jango Fett's Slave I in a smaller version that will not make you sorry you got the giant one in 2010. In an effort to keep prices down, even the Fighter Tank is a new, smaller sculpt. As such, they should be better toys than the current releases, and let's be honest: price is important here, and this should hopefully actually get kids to buy these. Think big Mini-Rigs... simplified, toy vehicles should actually be fun. As a long-term collector I'm not crazy about yet another version of toys I have many versions of, but hey, they got firing rockets and should be fun. Update from the future: I just got to play around with all 3 of these and they push the same buttons as the 5-joint Battle Pack figures. Small, simple, durable in feel and nicely designed. The Slave I has rotating cannons, pivoting wings, a firing rocket, and seating for one. The Fighter Tank has no rolling wheels, an excellent sculpt. Seats two figures. The Jedi Starfighter is thin in spots but has retractable landing gear, a single firing rocket, seating for one, and a rotating R4 dome. The R4 dome is scaled down relative to the action figures to maintain the scale of the ship. These look neat but probably aren't your cup of tea if you've bought every ship since 1995. Since they seem to be quality toys-- things for kids to play with-- I'm unreasonably interested in them as it seems parts won't fall off and they won't take up too much room. If you don't like it, blame people making better wages overseas. I'll make do. Anyway, back to the real-time article. A Star Wars Toy Exhibition in Paris, France will show the history of 35 years of Star Wars stuff. The slide showed numerous prototypes including a window-box package for the Star Wars Micro Collection Bespin Control Room, and man, it's really cool. I've never seen it before. Other items include rocket Fetts, 12-inch Kenner Lando, and other goodies. This runs October 4, 2012 to March 17, 2013. 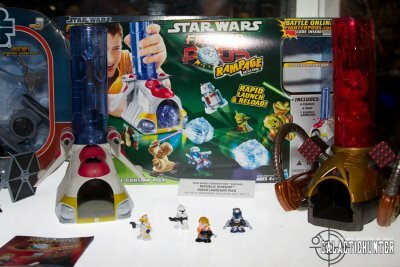 2012 exclusives include the previously announced Darth Maul Returns Battle Pack, now supposedly in December. (I would suspect the real date to be November or maybe even October.) It's a Target exclusive. The Special Action Figure sets (Droid Pack and Villain Pack) are on sale now, as readers of this set are well aware (and hopefully got theirs on the cheap. "He's a block, but he's an awesome block," said Vennemeyer of the Gonk droid. Target's Darth Maul Fighter Pods Tin will be out in September, with Ziro which they say they were not able to get into the 3 3/4-inch line. The Maul in the tin is metallic, making it different from the regular release. Kmart's AT-ST, out now, is next. The crew 2-packs are listed as "on shelf now" but it's not like I can find them. We hear $14.99 each, but, obviously, I ain't seen 'em. The Ewok Scouts are pretty fantastic, Wunka and Widdle are here to take over the set. Toys R Us' Ewok Pack and Yavin Pack were next, with October on-shelf dates. Well, we have ours now, so yeah. Whatevs. You know theyre awesome, so buy them. Also "October" is the Speeder Bike with Scout Trooper, which has a tripod cannon that can attach to the bottom of the bike to "add value" to it. You can see the jet engine when you pop the hood open, there's a clear display stand so it can "fly," and the Hasbro artisans added some detail to make sure this classic vehicle was as realistic as possible. The Scout Trooper has added articulation, including the neck, so he can look up and see where he's going. A small kickstand was added so the item can stay on the ground without drooping on your shelf. On the bigger end of things is the Toys R Us vintage boxed Millennium Falcon, a return of 2008's biggest and best take on Han's ship. The ship is unchanged so you won't necessarily feel the need to repurchase it, so good for you, Hasbro. We appreciate this. Joining it is the Endor AT-AT, which I find surprising as the Toys R Us stores near me are still nicely loaded with the Hoth one. The AT-AT Driver has been changed and this is the first-ever one with black gloves, so screw you variant collectors. Jocasta Nu is rounding out the expensive exclusives at Brian's Toys and the Dooku bust has a hidden Holocron inside it. Jocasta does not have a ball jointed neck as it may have distorted the sculpt in production. 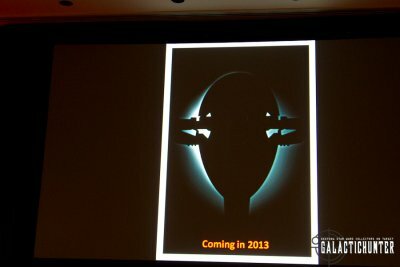 Boba Fett's Slave I is coming in 2013. Apparently in Vintage packaging. 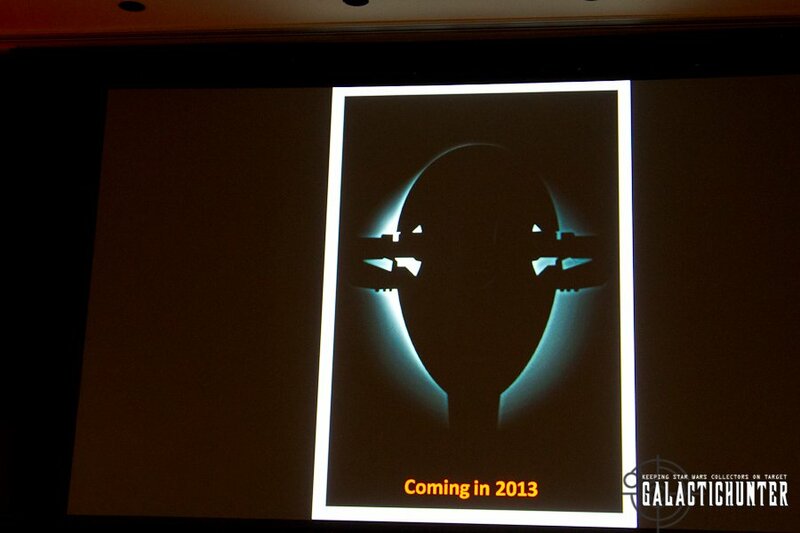 It was presented as a shadowy silhouette, but let's be honest, we know what this. "We should have more details at Toy Fair." That's it! Thank you! Goodbye! Won't you? Questions! The first kid asked if Galactic Heroes was dead. Yes. Replaced by Jedi Heroes. Another guy asked about the Class II vehicles. The new Class II vehicles are completely new, from-scratch vehicles as they are smaller. Are we going to see a smaller scale X-Wing at some point? Maybe! Will Mara Jade be on a vintage card or in a comic 2-pack? No Vintage, because Droid Factory. "She would be a phenomenal candidate to put on a vintage card eventually." Comic packs - "We're hopeful we can bring out comic packs at some point, when it makes sense. The Union one, maybe." Derryl's smile makes me think maybe Toy Fair. Count Dooku with 12-inch Speeder? Darth Maul Ultimate FX Lightsaber? Yes, Ultimate FX Maul lightsaber is out-- Derryl says it's TRU exclsuive, but I think it's on Entertainment Earth right now. I think there's some confusion, maybe mine, I don't have internet while I'm writing this. Derryl was coy about the 12-inch offerings , but you know they were announced at SDCC as limited articulation figures. KOTOR comic characters - or game? TOR? 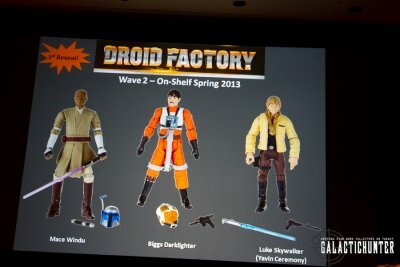 More TOR are coming, Derryl says, in Droid Factory Collection. KOTOR at the top of the list if comic packs come back, but apparently not elsewhere. I don't get the distinction of why TOR is OK for retail and KOTOR isn't, but that's why I just report on this stuff. Ewoks and Droids cartoon figures? Kneesaa is out, but there is no systematic effort to bring those figures out, says Derryl. Star Wars 1313 wave of figures? No. Why? It's a different kind of game, Derryl says, whatever that means. The way they're doing waves means no dedicated wave devoted to a game, they'll split it up over time if/when they get to those characters. Angry about Jocasta being late? Well, maybe 2012, who knows. Should be 2013. Part 2: Distribution? "Episode I didn't meet our expectations," Derryl said. "We did anticipate we would have interest..." and also said they made more, but they didn't get more collectors, so it's backing up. Time's up! Kicking us out. Can't say I'm not excited for that Boba Fett's Slave I. 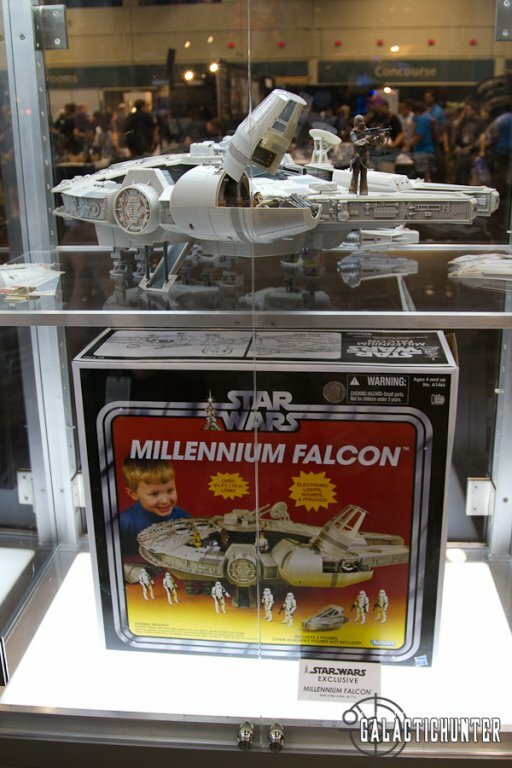 If it comes in Vintage packaging, all the better, but really I just want to make sure that it's the larger Slave I model and not one of these newer scaled down ones. And I hope I don't have to buy it with a whole other ship.